Subjects, styles, advertising, other relevant information: In the Cambridge Chronicle of 21st August 1869 is a report of a court action brought in Huntingdon County Court by Pinkney against James Annis, butcher and publican of Woodhurst, for libel, Annis allegedly having called Pinkney "a pick-pocket" and saying that he could prove it. Pinkney, a photographic artist at St Ives, claimed that these false allegations were adversely affecting his trade. The facts of the case were never heard, Annis apologising to Pinkney and Pinkney consenting to an award by the court of 20/- including costs. No obvious trace can be found of this photographer in the 1871 census returns. A number of early photographs of St Ives by Pickney were copied by Herbert Norris and can bnow be found in the Norris Museum. PH/S.IVE/Pa.Chur/04a-b, PWD/S.IVE/087 refer. Subjects, styles, advertising, other relevant information: In the 1891 census Percy was a visitor at an address in Theobold Rd Holborn, London. In 1901 Percy was at 10 Emmanuel Road Cambridge where he was described as a journalist and printer. His father Frank Piggott b:1846 St Neots, was also a journalist and printer. In 1911 Percy was living at 154 Chesterton Road Cambridge, still listed as a journalist and printer. Percy was living with his wife Louise b:1881 Kings Lynn and son Douglas Ivor b: 1908 Cambridge. Percy was the local secretary of the Lifeboat Saturday Fund in Cambridge in 1901-4. On 22nd March 1917 Percy applied for temporary exemption from military service - his case was heard in private and an exemption granted until 21st May. References: The only evidence found so far that Percy was also a photographer is that the Cambridgeshire Collection has a tiny copy of a carte de visite by this photographer in their carte de visite collection ref c.65.5. Newmarket Journal 10 January 1985, 23 March 1989. Subjects, styles, advertising, other relevant information:The Peterborough Advertiser,10/8/1912, p2, has an article on the choir stalls in the Peterborough Minster and captions one illustration "H.Plowman, Caster Post Card Series". Harry Plowman, (1877-1952), son of the former Cathedral Sexton, resided in the Minster Precincts at Peterborough in 1901 and 1911 and was a Cathedral Verger. In 1891 Harry worked as a printers errand boy, so may have had long term connections with Caster. Harry was definitely a photographer as he registered two of his photographs of the Peterborough Cathedral clock at Stationers Hall for copyright purposes in 1905 and 1906, but photography may have been a secondary interest. Working Dates: The company operated from 1933 -1969. 1950s in Peterborough. Subjects, styles, advertising, other relevant information: Polyfoto Ltd was a large company with many local agencies (listed here: www.photodetective.co.uk/PolyfotoList.html.) 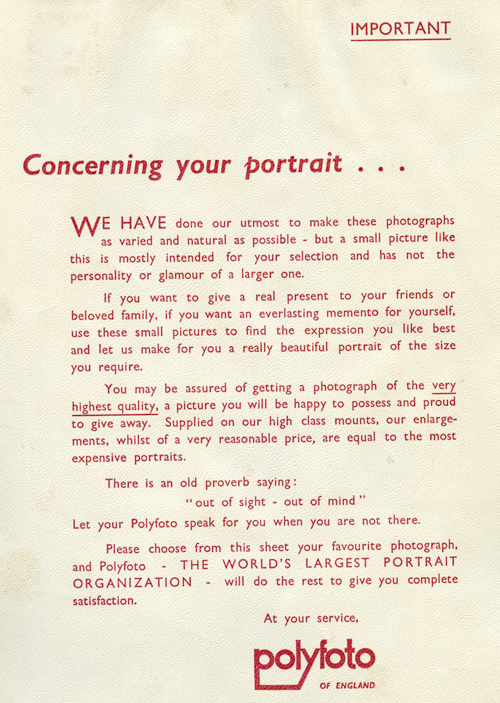 From 1933 Polyfoto Ltd of 7,8 and 9 St James St London SW1 advertised for agents in the following terms: "The Polyfoto system of photography offers you a unique opportunity of starting a studio of your own with limited capital but unlimited prospects. Previous professional experience is not essential, so if you possess ability and enterprise apply to us for further details, terms and agency agreement" Their best known product was a 48 exposure proof sheet of images (6 wide x 8 tall) with a numbered clear paper cover, from which the customer would select individual images for printing and enlargement. The set of images on the proof sheet was produced with a special camera. In 1939 some studios were offering 48 different positions for 3 shillings. In 1949 the prices were 7/6d, reducing to 5 shillings and an alternative "baby-poly" format was being offered for just 2/6d. (Lincs Echo 31/12/1949). In many cases the customer was happy to cut up the proof sheet and to use the small images in the family album or as gifts to friends or family, rather than order enlargements. 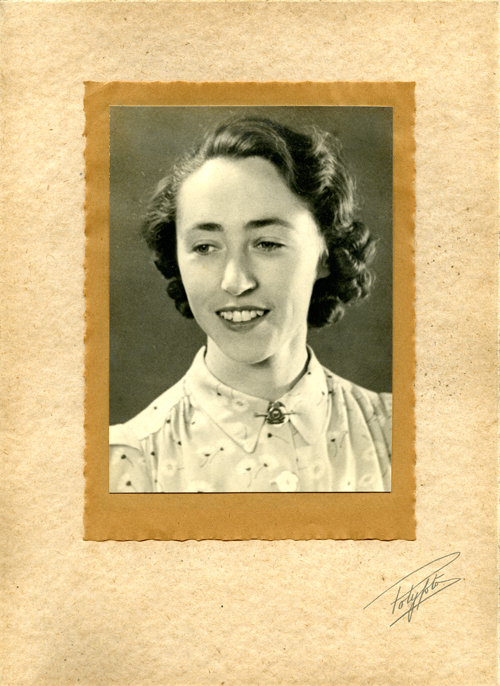 Today irregular shaped cut-out sheets are often to be found in old albums - showing the images which were not chosen from the original proof sheet for distribution. 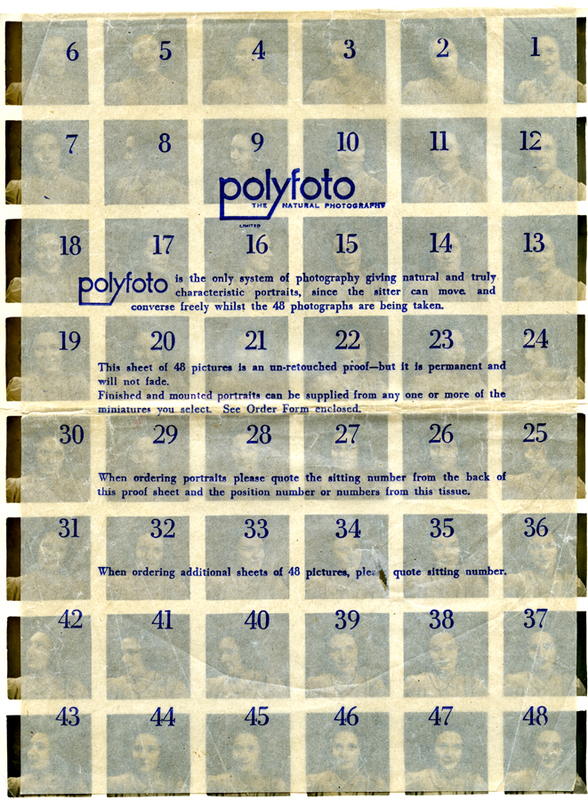 Below is a rare uncut example 48 proof sheet with clear numbered overlay, from the 1950s. 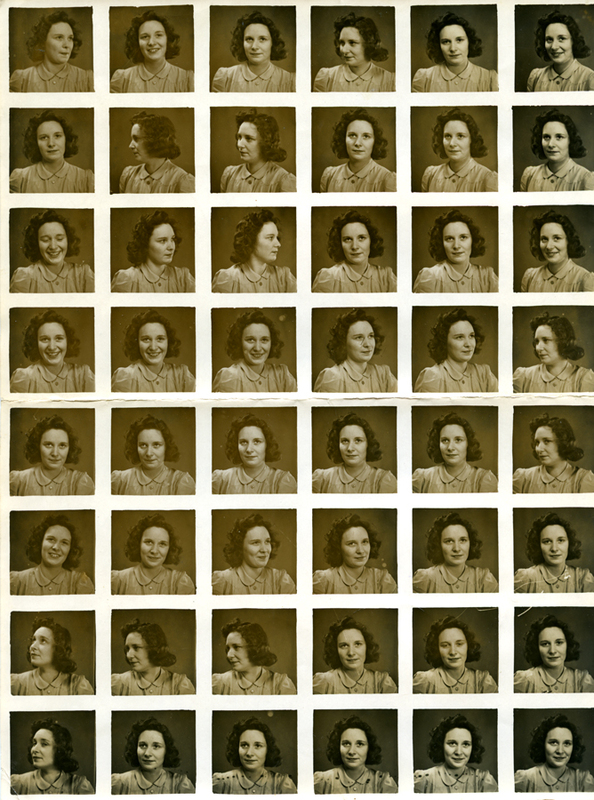 It would appear that the earlier cameras (a dated example proof sheet in the author's collection is from Scarborough in 1942) produced 48 images each with square corners, while on later ones, each individual image had rounded corners. 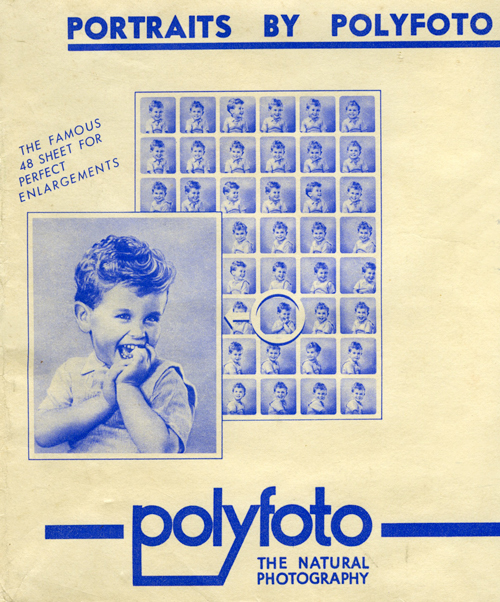 Also, for complete sheets, early examples had a waxed paper over-sheet with blue printing and more recent examples had a clear polythene oversheet with blue printing and the polyfoto logo printed in blue and white, then with red printing and red and yellow Polyfoto logo. Proof sheets had at least two different means of identification. Older examples had a reference number hand written in pencil on the reverse with two letters, followed by a number of digits. An August 1942 proof sheet from Scarborough has the number LR 7610. Later examples had the reference number set up on a frame, which appeared in shot in the top right hand corner of image number 1, itself in the top right of the sheet. Two examples are shown below EW14076 and EW14077. believed to have been taken at Ewell, Surrey. Also shown below are the advertising from a polyfoto envelope and the covering letter which accompanied proof sheets. The Peterborough address in Bridge Street is a few doors down from the old Angel Hotel and is caught in a street scene on the Peterborough Images site here: http://www.peterboroughimages.co.uk/blog/wp-content/uploads/PolyFoto.jpg . In Cambridge, Robert Sayle's department store 2-6 St Andrews Street, announced the opening of their Polyfoto studio in the Cambridge Daily News of 17th April 1939. Tom Johnson recalls that Polyfoto also had a studio at 21 Market Street Cambridge, prior to Campkins taking over the premises for photographic and Hi Fi sales; the property was not owned by Campkins but belonged, as far as he could remember, to the City Council. By 1949 the UK Polyfoto business was owned by Huddersfield colour photographic firm Dufay-Chromex Ltd. Press adverts concerning Polyfoto seem to cease in the British Newspaper Archive from around late 1955. (Or is it the case that digitised newspapers in the archive are fewer thereafter?) The London Gazette covers the liquidation or dissolving of Polyfoto companies as follows: Polyfoto Canada Ltd 7/3/1952; Polyfoto USA Ltd 2/4/1954, Polyfoto International Ltd 29/1/1954, Polyfoto Schools Portrait Service Ltd 23/11/1971 and Polyfoto Holdings Ltd 11/9/1984. 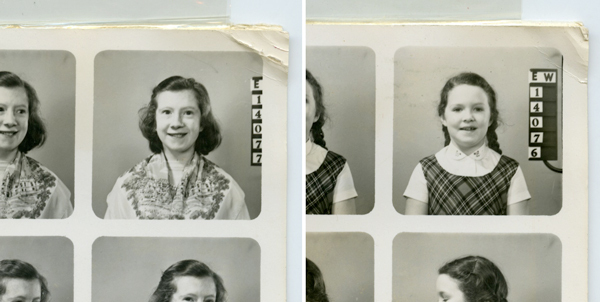 It appears that Polyfoto (England) made it into the 1960s, by which time automatic photo booths had started to become widespread in the UK, offering a cheaper simpler alternative. Examples of Polyfoto images and further information can be found at: www.photodetective.co.uk/Polyfoto.html. 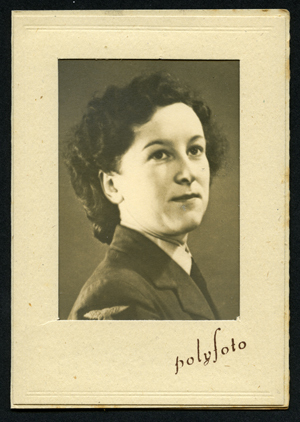 Shown below is a portrait (author's collection) of a uniformed woman, named as "Joan" and dated 1944 in manuscript on the reverse. 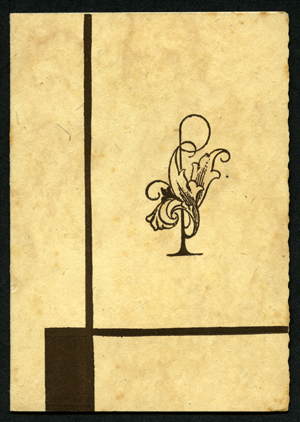 The photo is 3.5 x 2.5 inches in a buff folded card mount with a monogrammed letter "P" on the front and "polyfoto" beneath the image. 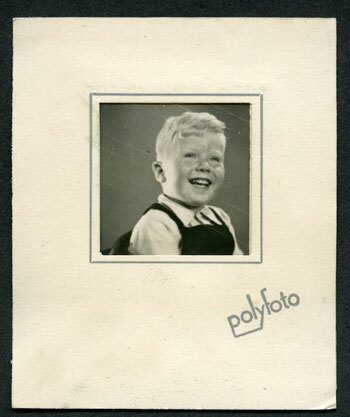 Next is a single Polyfoto image in card mount 77 x 63mm, in manuscript on the rear "Richard - July 19?6 (2 1/2 years)", believed from 1956. Beneath is a 6 in x 4.5 inch enlargement on a two tone mount with deckle edges and manuscript "Polyfoto", the whole having an individual hand-finished appearance, rather than appearing mass produced. Subjects, styles, advertising, other relevant information: In 1901 Harry, the son of Unitarian Minister Wm Jno Pond b:1859 Blakeney Norfolk, was living at Chapel Bridge, Lutton Lincolnshire and was a photographer working on his own account. According to the 1911 census, Pond was a photographer living in 1911 with photographer John William Rignall (of Starr and Rignall) and his family at 85 Regent Street Cambridge. In the 1939 Register Harry W Pond b: 27/2/1881, photographic manager, was living at 5 Guest Road, Cambridge with his wife Dorothy R Pond b:9/7/1890 and daughter Joy D L Pond b:1916. Was he a manager for Starr and Rignall? Carte de visite, Cambridgeshire Collection, ref C65.5. Subjects, styles, advertising, other relevant information: In 1871 Thomas Porter was listed as a resident of 6 St Matthews Buildings Norfolk Street Cambridge and his occupation was shown as a warehouse porter. Living with him at the same address were: his father Charles Porter, a gardener, b:1821 Dean Bedfordshire, his mother Ann, sempstress, b:1827 Dean Beds, and his brothers: William B. Messenger, b:1857 Mile End, Charles J., Apprentice, b:1860 Mile End Town, Henry E. scholar, b:1864 Cambridge, Arthur, scholar, b:1868 Cambridge. In 1881 Thomas was living in St Pancras London with his wife Annie and son Frederick - the census return didn't list Thomas's occupation. Thomas was listed at the St Matthews Buildings Cambridge address as a photographer in the local directory for 1884. In 1891 Thomas and his family were living at West Ham and his occupation was shown as a painter. Subjects, styles, advertising, other relevant information: Itinerant Daguerreotype artists. The Bury and Norwich Post of 31st May 1854 has an advertisement: COLOURED AMERICAN DAGUERREOTYPE PORTRAITS, FROM 3s. 6d. EACH, At the Daguerreian Rooms, CORN HILL, BURY ST. EDMUND’S. MESSRS. PORTER & CANN RESPECTFULLY inform the Nobility, Clergy, Gentry, and inhabitants generally of Bury St. Edmund’s and vicinity, that Portraits by the above beautiful process are taken daily, for a short time, at the Rooms, 14, CORN HILL. Invalids and others waited upon at their own Residences. May 29 1854. And in the same newspaper on 12th July 1854: PHOTOGRAPHIC APPARATUS supplied and the Art taught. —Terms of Messrs. Porter and Cann, 14, Corn-hill, Bury St. Edmund's. Portraits taken daily ; sunshine not necessary. Although these advertisements relate to Bury St Edmunds, Heathcote links Porter and Cann with Newmarket in August 1854. Address: 18 Market Street, St Neots (1977) 24A Market Street St Neots (1980). Address: 1990 1 Longstanton Road, Oakington, from 1995, 117 Station Road, Histon. References: Cambridge Evening News 6 April 1995. 23 Dec 1998.